Many of the inefficiencies in the economic systems developed by humans stem from misunderstandings and misinterpretations – communication errors, and to a lesser degree, intentionally misleading messages. The more humans exchange digital artefacts rather than physical goods, the higher the potential for significant economic impact of poor communication. By definition, exchange of physical goods occurs in terms of discrete units, and similarly the exchange of digital information can be modularised in terms of discrete units. The optimal size for these units is a granularity that is aligned with the units of work that make sense for producers and consumers of digital information: software applications, songs, movies, financial transactions, travel bookings, tax returns, etc. 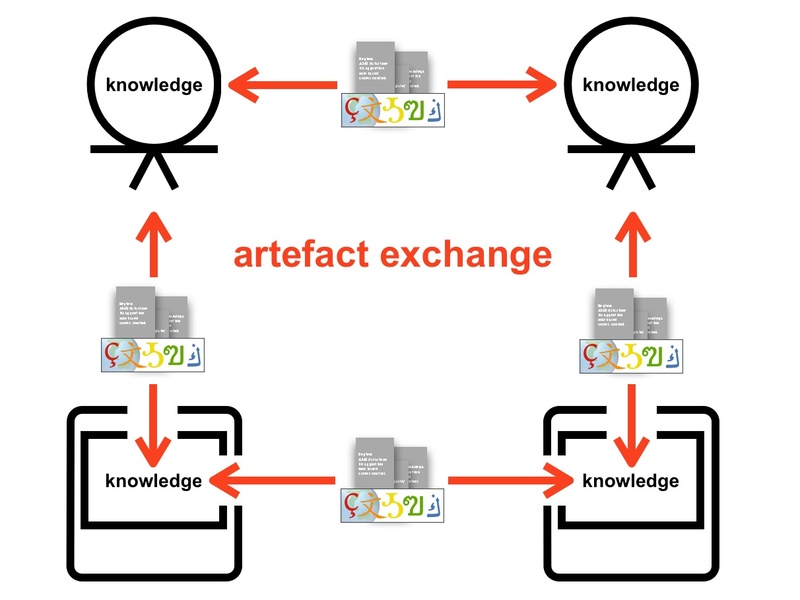 A commonly used term for the units or modules of exchange of digital information is artefact. It is important to differentiate between mental models (pure representations of knowledge) and concrete representations expressed in a structured database, a programming language, a natural language such as English or Chinese, or some other digital encoding format. Research results from cognitive science indicate that mental models can be approximated with the help of formal mathematical concepts, and can be visualised in human-friendly two or three dimensional graphical symbol systems. In particular the mathematics of denotational semantics enable the definition of semantic tokens to be distinguished from the construction of models that reference the semantic tokens. Software tools such as the S23M Cell Platform use this technique to significantly reduce the potential for unanticipated misinterpretation of artefacts. The roles of market operator, provider, and consumers can be assumed by teams or by systems. In the example above, the role of market operator is assumed by the owner of the ice cream parlour, and the consumer is a one person team. 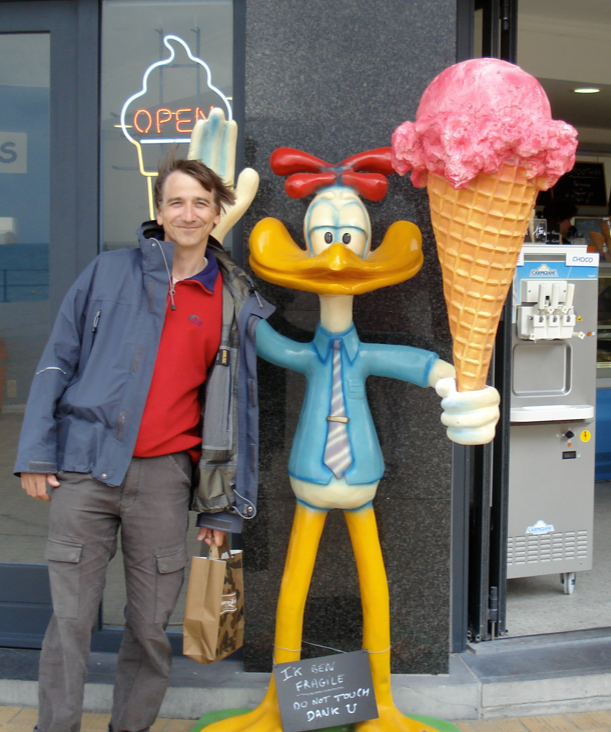 The conversation between provider and consumer may not only revolve around cash and ice cream. It may for example include a comment that there is an interesting exhibition of local artists two streets down the block – added value, especially if you enjoy art exhibitions. Alternatively, the conversation may be part of another conversation, that started between the consumer and a public transport ticket machine that only accepts coins, leading to a desperate purchase of an ice cream cone in order to obtain the small change to buy a tram ticket. This is a very simple example of a nested conversation involving a service supply chain. Most teams and systems engage in multiple conversations in different contexts, and thus assume both provider and consumer roles. The notion of view point is useful to avoid creating the false impression that only teams can assume the consumer role. With this definition, the conversation between producer and consumer can be visualised as follows. 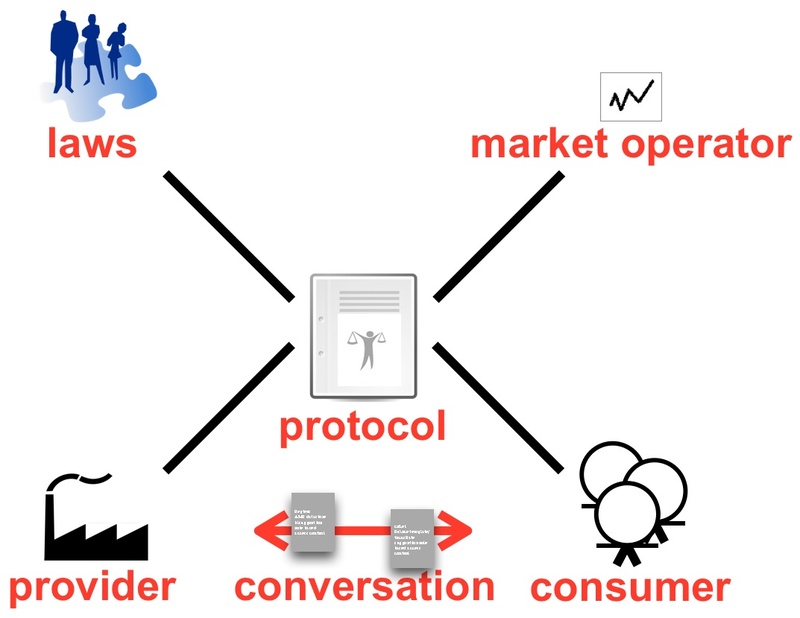 The view point concept in conjunction with the concepts of conversations, market operator, and protocols can be used to construct arbitrarily complex value chains, which can be refined as needed, to deliver a specification for the operation of one or more markets. Given the observations above on the construction of formal mathematical models based on semantic tokens, it becomes clear that software systems that facilitate value exchange conversations will increasingly play the role of market operator in the online economy. The most familiar example of such a system is Ebay, but there are many hundreds if not thousands of further examples. The number of online markets for exchanging or sharing value is currently undergoing a rapid expansion. On the surface, technology may no longer seem to be a limiting factor in implementing new markets, but challenges remain in orchestrating deep and agile software service supply chains, even for big operators such as PayPal.